It's harvest time at Marina Colonna's farm in San Martino in Pensilis, Molise. Contemplation and silence, lush wilderness and breathtaking vastness. “After that expedition, my perception of things changed,” said Marina Colonna, when describing the overwhelming emotions she felt in the mountains of the Trans-Himalayan region of Ladakh at 4,000 meters (13,123ft). Just then, the olive mill machinery started operating with its clangor, while we relished a different and yet enchanting landscape shaped by small rivers, forested lands, corn fields, vineyards and olive groves: Masseria Bosco Pontoni, near San Martino in Pensilis, is the safe house donna Marina always comes back to after all her journeys. And you get the strong feeling that the high-quality liquid gold she produces here, in the hills of Molise, is both the fruit and representation of her full and passionate life. In the middle of a promising career in documentary production which took her all over the world, one day, talking to her father, Prince Francesco Colonna, she decided on a whim to help him in reshaping the image of the company and, in about a year, she was able to launch her first production line. “I was unaware of what was happening in the agri-food market,” she revealed. “Therefore, I tried to understand how structured olive oil companies worked, and since I only had an idea about the design of the vessel I desired for my oil, I started looking for a glassmaker.” Then, the iconic bottle was born. Colonna attended the first wine fairs, displaying her products in the booths of winemakers. Then, she pushed and contributed to the creation of the first fairs dedicated to olive oil and she is probably among the pioneers in Italian exports of high-quality EVOO. In thirty years of quality and successes, she also dealt with difficulties and hard times with a lot of nerve. 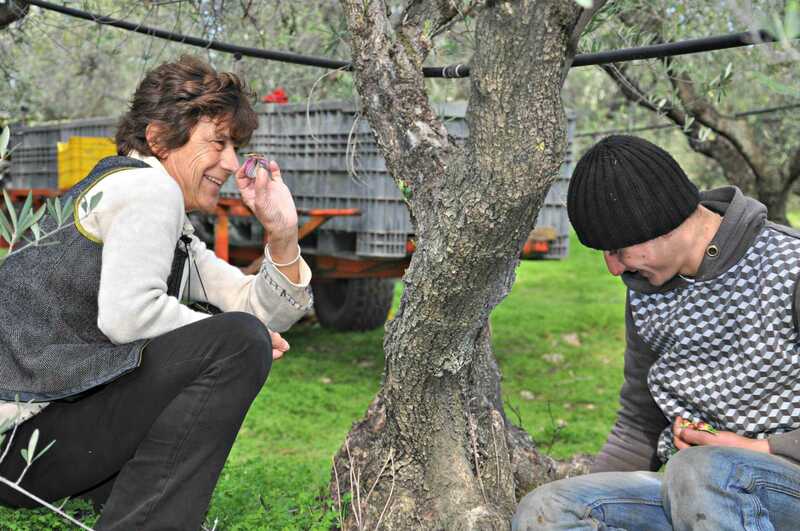 A forward-looking attitude led her to manage a beautiful farm with several high-quality agricultural productions, of which extra virgin olive oil is the crown jewel. 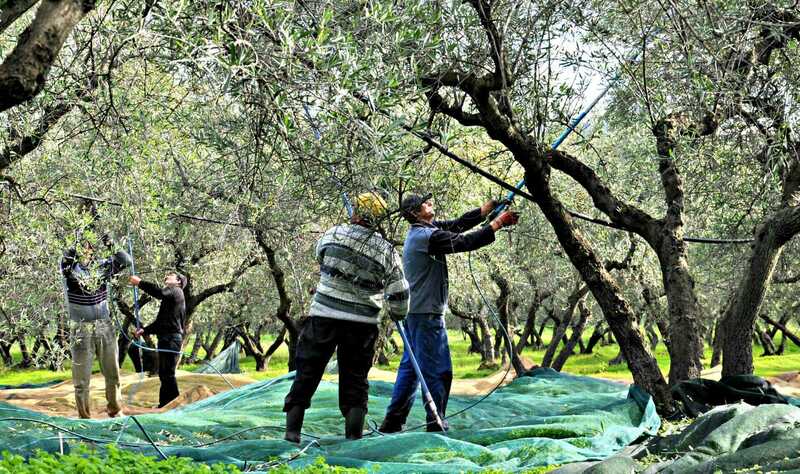 Twenty-eight thousand olive trees include plantings of Frantoio, Leccino, Peranzana, Cima di Melfi, Termite di Bitetto, Maiatica, Carolea, Rosciola, Itrana and many other varieties. There are experimental ones, native cultivars like the Gentile of Larino and other rare types, spread out over 55 hectares (136 acres) of olive groves. “This harvest is promising to be excellent,” she remarked, while we walked through lush olive trees laden with healthy olives soon to be picked. “We started with Ascolana, we proceeded with Leccino and the other varieties,” she illustrated, while harvesting operations were underway with the typical crates, nets and other harvest tools. Yet Termite di Bitetto and Kalamata organic varieties were scrupulously picked by hand and then brine-cured as delicious table olives. “Different varieties are collected and crushed separately, then blended with a thorough job of tasting and mixing over the year,” said the producer of Colonna Classic, which is among the extra virgin olive oils awarded at the NYIOOC 2017. The production line includes organic blends, monovarietals, PDO, and citrus olive oils. Marina Colonna was probably a trailblazer with Granverde, launched in 1990 — an organic lemon-flavored olive oil obtained by crushing organic lemons from Sicily together with fresh olives from her estate. She used the same method for organic orange, tangerine, bergamot, basil, ginger, cardamom, chili pepper and rosemary flavored oils, while she created a line of infused oils by combining EVOO with essentials oils of juniper, sage and rose. We came back to the mill to control the activity of the machinery since it had recently undergone technological updates. Marina Colonna supervises all activities, with her special energy which is a fuel for her coworkers. While we tasted a great, fresh extra virgin olive oil, I had a feeling that Masseria Bosco Pontoni is the place where history meets innovation and a little hunch may become a remarkable breakthrough.